When we form our leisure habits, we do so from our positive experiences within that pastime. Sometimes obstacles get in the way of our outdoor experiences which may prevent us from fully participating. In the above photo, you can see the way to this beach is not only Narrow but precarious. These obstacles do NOT deter these windsurfers from having their day in the wind and water. 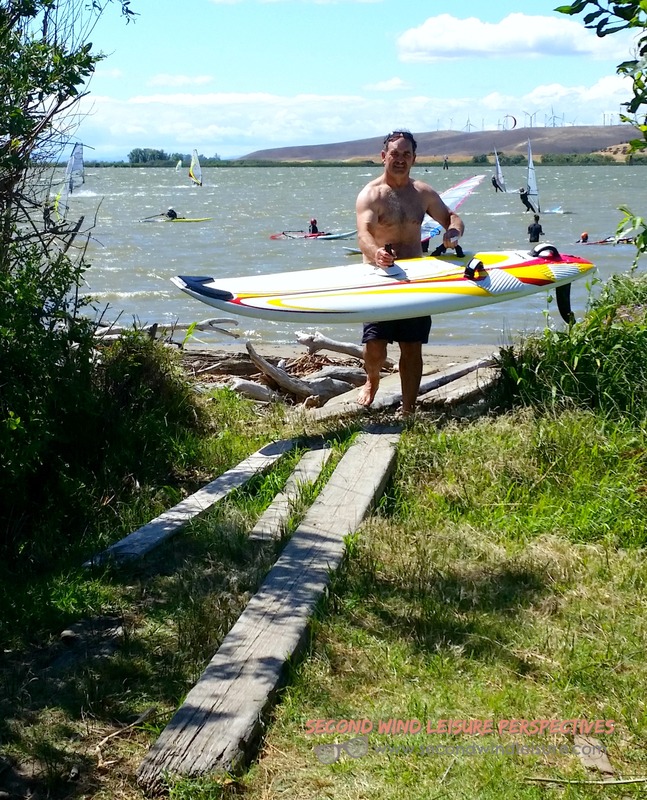 Isn’t this nice of my hubby to carry my windsurf board back to the truck after a long day in the water? Some of the obstacles we might face in our leisure pastimes are related to time and location. Other obstacles might be our perceptions of leisure and whether we have worked hard enough to earn the time. Still others experience fear when trying something new and that path to experiential learning becomes too narrow. 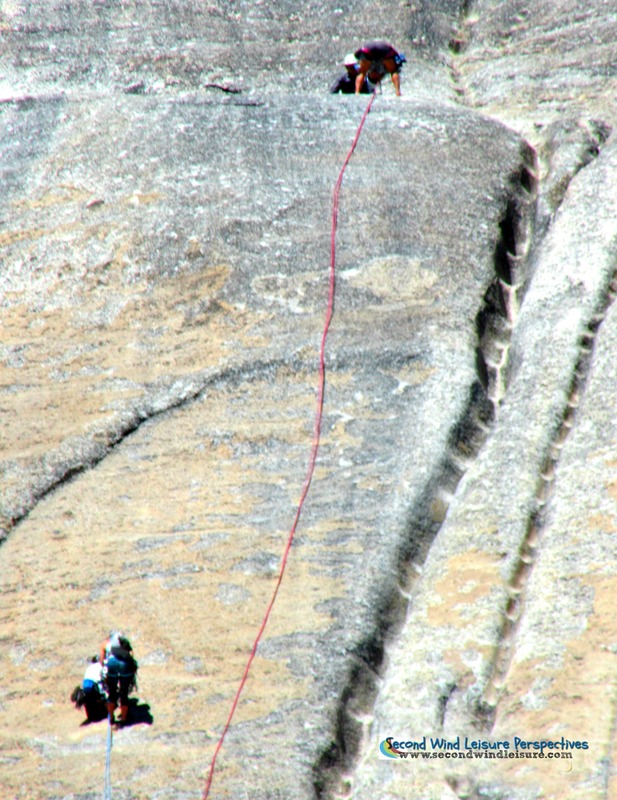 I like to think that these women climbers in this photo, not only earned their leisure time, but conquered their fears as they climbed this narrow way up the face of Lembert Dome in the Yosemite high country. Why do we choose a narrow path to our leisure? Hungarian Psychologist, Mihaly Csikszentmihalyi, popularized the concept of “flow,” a highly focused mental state that can occur both in leisure and work. Flow is the sense of effortless action people feel in moments that stand out as the best in their lives. The physical and mental challenges afforded by both windsurfing and climbing, depicted in these photos, paves that narrow path with gold, so that flow can be achieved. 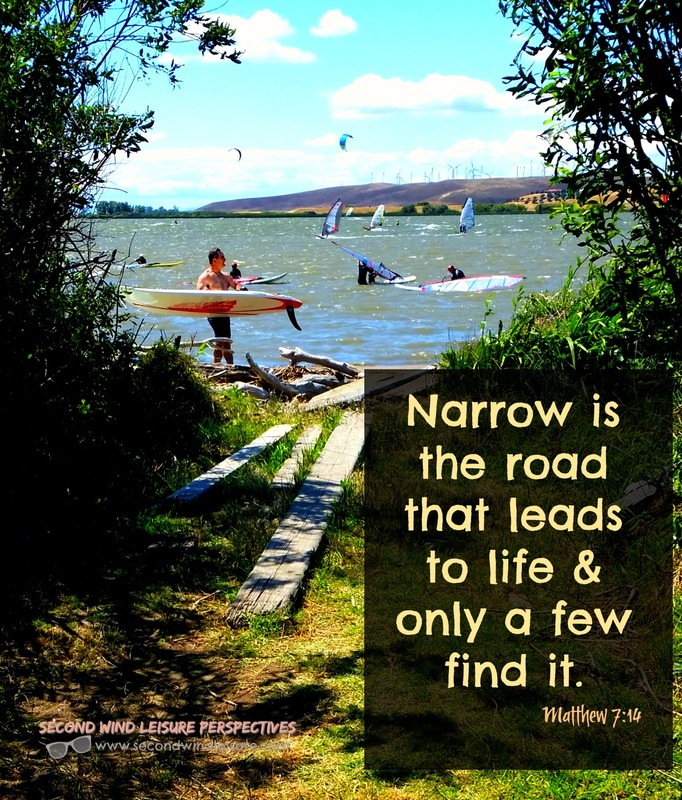 Narrow is the road that leads to life and only a few find it. When I read this, I understand how true this is. If we equate leisure with life, we let too many obstacles get in the way of living our lives to the fullest. The path to happiness and fulfillment may indeed be narrow, but it is one worth taking. The Weekly Photo Challenge is available to all bloggers and posts every Friday. What obstacles prevent you from experiencing your well-earned leisure time? A thought provoking post, Terri, and I really like the picture of your husband carrying your board. Super composition! I’m not so much into adventure sports,Terri, but I do admire those who push the limits. A great reminder to be brave though. Love this parallel and terrific images. I love this Terri! I do struggle with taking leisure time since I still work. I run my own company and I am the boss yet I have to talk myself into taking a few hours to meet with a friend, go on a bike ride everyday and take time to enjoy my garden. As much as I can and like to get into a zone on a business issue, I like to balance getting into a zone of leisure activity too as just important! Thank you, Haralee! Your hobbies sound fantastic! Right now mosquitos are our barrier. They are thick, swarming and bite through the Off. Yesterday I heard two women at the gym discussing giving up on their gardens because of the mosquitos. Two more inches of rain last night, so they will be around a few more weeks! Mine is time. That’s something I’m working on in 2016 and going forward. Even if it’s day trips out of time, I need to make sure that I’m enjoying my leisure time and unplugging from the world. A wonderful article, Terri, and very thought-provoking with very original ideas. I’m not someone to take physical risks, although I love exercising. But I do try to take risks in my other leisure activities and live life to the full. That sounds fantastic, Terri – those students are lucky to have you. We’re only on this earth for such a short time – we should make the most of every moment. Time is such a factor in most peoples lives. They don’t realize that if they make time for leisure their health and happiness will improve. Thanks for another great read Terri. Love the photos. Thanks, Sue! Your singing my song, girl! I feel that the reason why I could not fully enjoy my leisure time is due to the fact that I feel guilty when doing it. I would love to go out and have fun while doing physical activities like kayaking or rock climbing but there are always the feeling of not being able to fully enjoy it while something is on my mind. The intense guilt is not healthy and I think that I need to balance it out with my work, school and leisure. Thanks for the great post and much love. Oh that makes me sad, Izrael. Leisure should ease the feelings of guilt and provide an escape. As a leisure educator, I give you permission to go have fun and enjoy it! Thanks for sharing! Bad knees, bad ankle, no backup. Still I do find my time in nature, wonderful, if not as testing. April, windsurfing has almost broken me, but when I get a great session on the water, there is nothing like it. I wrecked my knee hiking last year in Oregon…that’s what prescription-strength ibuprofen is for, LOL! Glad you don’t let those things stop you! I am way beyond rx ibuprofen. Take care of those joints. Sorry to hear that April! I definitely pick my battles these days! Excellently written, Terri. I’m proud of you.